Just click print and you're done. Super fun game for Spanish class. 60 different black and white boards. 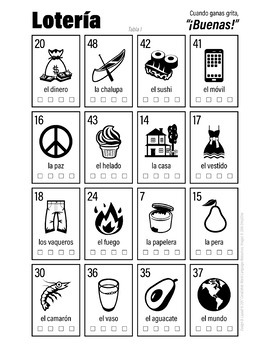 Loteria is a Mexican game similar to bingo with images in place of numbers. 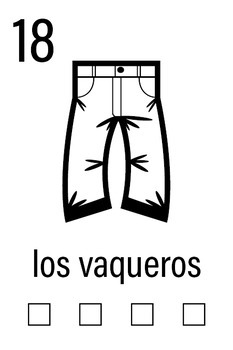 The traditional loteria set contains images that are objectionable for school use, this set is fun, whimsical, and completely G rated. Everything you need to play is included in the PDF. It is setup so that all you have to do is hit print and you will get the instructions, call lists for games (more info below), a master list of the images, and 60 game boards. All your students need to play is a pen or a pencil. There is an even number of pages so if you print two sided, there won't be any blank back sides. There are 60 cards each with 16 images. The 16 images come from a larger pool of 54 different images. 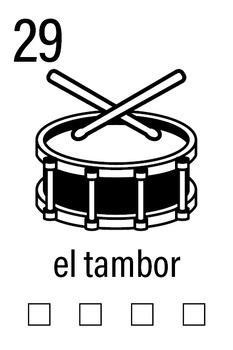 All of the tablas are numbered and include the winning phrase "Buenas!" at the top. 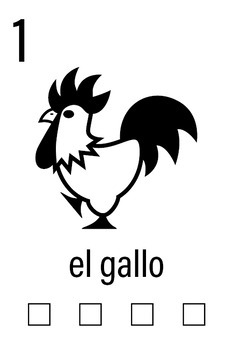 The images are a mix of vocabulary from the traditional set (el gallo, la chalupa), common words that most students know (la fiesta, el libro), and fun words that students will enjoy (la manicura, el marciano, el unicornio). Each image has four squares at the bottom for students to check off as they are called. You can play four games with each tabla. All of the graphics are high quality and uniform. No wonky edges, pixelation, or handwriting fonts. They look great and my students love the emoji. A call list is included with 12 randomized games. Typically the caller draws from a deck of cards, but this makes checking your students' matches difficult. By using the call list you can easily check off if your students' wins are legitimate.